Performance is fairly poor on modern operating systems, with multiple issues with the way that the game window is rendered and movie compatibility. Fixes listed on this article make the game playable, but the experience is relatively unfriendly. 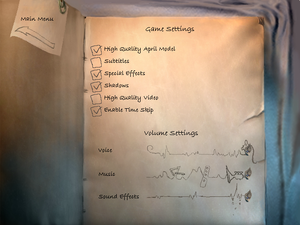 The soundtrack was once available for free at the developer's website, but is no longer. 4 CD-ROMs, a 2 CD as well as a DVD re-release has been made. Patch 1.61 adds an external configuration tool along with some bug fixes. This patch is for retail releases only. Steam version already include this patch. Patch can be forced on other versions by using an archive utility to extract the files. Just to have audio, you must convert iss files to ogg (audio only) format using vorbis codec and rename format to ovs. That's working! The only problem is the lack of character encoding other than the English version.
] You can run The Longest Journey with ResidualVM daily build on many OS with most bugs fixed including antialiasing problems. No need to download anything else. Save game data location can be changed, see change save game data location. dgvoodoo Can increase the resolution, but the aspect ratio will stay at 4:3. Can be forced in driver. See Graphic glitches/flickering with forced AA. Cutscences capped are capped at 15fps, gameplay at 30. No native option to run in windowed. Game window cannot be moved or manipulated, and there are no fixes for this issue. Open %APPDATA%\The Longest Journey\Preferences.ini (or Preferences.ini in your game install folder). Under the [DirectX] heading, type bool_StartFullscreen=0, and save your changes. Will not work on every graphics card. Sometimes connecting an external monitor will force the game into "windowed mode". This is the simplest and most stable solution. 640x480 is not supported by many modern displays. Right click the game shortcut. Choose "Run in 640 × 480 screen resolution". When exiting the game, the confirmation dialogue is blank. This appears to only affect Windows 10. Use the -DisableMaxWindowedMode command line argument. You can add some compatibility bits to the game. An unofficial patch has been made for this which you can download from here. Default fonts can be very difficult to read. Be sure to backup the gui.ini file! Some text may not align properly in dialog boxes. Open %APPDATA%\The Longest Journey\gui.ini (or gui.ini in your game install folder). Issue with not being able to view the Bink-encoded movies. Issue with not being able to display a game window (black screen). Versions prior to 1.61 do not have a separate Configure.exe utility. This fix turns off the game's hardware graphics acceleration. Only affects the 3D models on screen, as backgrounds are rendered in 2D. Run Configure.exe that you'll find in the above folder. Change one of the options (doesn't matter which) and click ok - this will create the config file. You can open Configure.exe again and switch the option back if you want. If it doesn't work, try to create multiple display (VGA, extend), as shown in this video. Also u can put those two monitors you have just created in cross position, so your mouse will not run "out of screen". This fix only applies to laptops. Change the power settings to 'High Performance' in the Control Panel. Press Escape before the cutscene finishes. Also, save at every new location. That way you can watch the cutscene, then reload your game after the crash and skip ahead. Under the [Preferences] heading, change bool_HighResVideo=1 to bool_HighResVideo=0 and save. For digital releases, go to in-game options and uncheck "High Quality Video". On some graphics cards, the game will crash upon entering the Police Station. Fixed with a special patch: <path-to-game>\station_fix\TLJ_PoliceStationFix.exe. If necessary contact GOG.com support for a copy of the patch file. Set the game to 16 bit color. If all else fails you can try right-clicking the game icon, select Properties, select the Compatibility tab and check the box for "Run in 640 x 480 screen resolution". Fixed with the 1.61 patch. Extract 01.Xarc from PoliceStationCrashPatch.zip and copy it to <path-to-game>\32\01, overwriting the existing file. Run Configure.exe found in the main game directory. In the launcher, go to Advanced Options. Enables running the game at higher resolutions and with anti-aliasing on cards that aren't supported by the game directly. 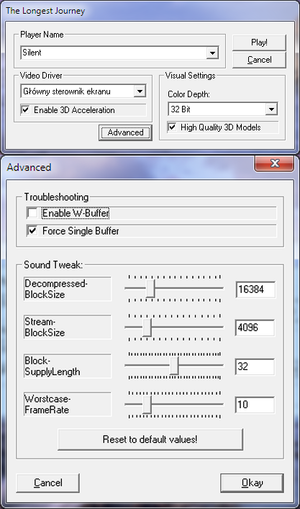 Any GPU driver profile for Longest Journey should have anti aliasing disabled. The game's "High Resolution April Model" option must be enabled. Allows use of ReShade for additional post-processing. 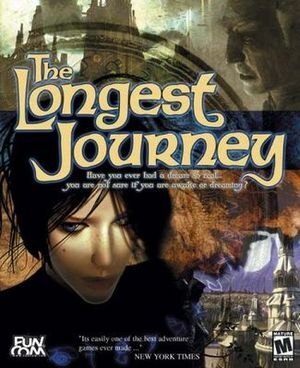 Copy the three DLLs from dgVoodoo\MS folder to your Longest Journey game folder. Add your Longest Journey game folder for "config folder/ running instance"
Output API: "Best available one"
Adapter to use/enable: select your GPU. Appearance: Full Screen, scaling mode "Stretched, keep aspect ratio"
Color adjustments: Defaults or change to taste. Miscellaneous: All unchecked except "force vSync"
Resolution: Must be a multiple of the game's native resolution (640x480). Run the game with hardware acceleration on. You can use any number, just remember to create the numbered folder under the Save folder first. Can be used to use Dropbox or OneDrive for cloud saving if the service can be mapped to a drive letter. If using a cloud service mapped drive ensure allow off-line use is enabled. Edit line SaveDir with the full path you wish to use for saves. ↑ 2.0 2.1 File/folder structure within this directory reflects the path(s) listed for Windows and/or Steam game data (use Wine regedit to access Windows registry paths). Games with Steam Cloud support may store data in ~/.steam/steam/userdata/<user-id>/6310/ in addition to or instead of this directory. The app ID (6310) may differ in some cases. Treat backslashes as forward slashes. See the glossary page for details. This page was last edited on 19 March 2019, at 13:03.